Samsung has introduced the best quality phones and its two phones are now leading as the top 10 best smartphones of 2014. The Samsung Galaxy S5 is one of the best leading phones with cool and really fancy features. One of the most exciting features of the Galaxy S5 is the fingerprint scanner, which can be utilized for extra security among other things. This allows you to unlock the device by simply swiping the home button, and you can also use the feature for other apps requiring fingerprint authentication. If you set up an account on your Samsung S5, you can locate, ring, or wipe your phone remotely. You can even keep your device from getting reactivated if it by chance falls into the wrong hands. S5 can send your location and an SOS text message to a designated contact if you tap the power button quickly three times. The device will turn on location automatically to do this and will also send pictures from the front and rear cameras to your emergency contact. Another unique feature of the S5 is the Download Booster. This combines the Wi-Fi and 4G connectivity to increase download speeds when you get a file over 30MB in size. This function is great when you're in a rush to download large files like movies or TV shows because when these two internet providers connects with each other, they make the downloading speed very fast. If you are S5 user, you don't need to worry about spills, as S5 is completely water and dust proof. The ports at the bottom of the device are covered, but you still need to be careful that your phone's back is securely in place after removing it. Samsung Galaxy S5 has an amazing 16 Mega Pixels camera which gives an outstanding result. To enhance the result of your picture and videos even more, there's a "Nifty Feature" through which you can adjust focus levels (from Near to Far or Pan Focus) after the photo is taken. Color filters can also be added before and after the photo is taken. Samsung S5's battery saving mode is a life saver for those who are away from a power outlet for long periods. This enhanced feature saves your phone's juice better than ever before. This mode is in the Quick Settings menu of your phone. These include a grayscale mode that switches off the phone display's colors and the option to turn off mobile data when the screen is off. If this special feature is enabled, the phone will last in standby mode for days. Galaxy S5 also allows you to increase touch sensitivity so that this isn't a problem and as the screen of the S5 is 5.1 inches therefore it is a problem for some people to handle its large size, another facility that this phone provides is Its screen shrinks in size and you can easily handle it with one hand. This has been just a little introduction to the fancy and cool features of Galaxy S5. This phone is full of even more such features. Apple creates wonderful products and so is the case with iPhone 6 plus. After releasing iPhone 6, Apple released iPhone 6 plus which I an exception for sure. The stylish, slim, sleek, shiny, slippery and attractive body of 6 plus have sought the attention of many blogs about technology. Its body shape and style is considered as one of the best looking Smartphone. There's no denying that the iPhone 6 Plus feels great in the hands. 6 Plus has the best battery life of any iOS Smartphone to date largely because it's got the biggest battery (2915mAh) this is the reason why it has a great battery life. 6 Plus also facilitates with a better power saving mode. When you're really low on juice, it's possible to turn on grayscale mode to save power. IPhone 6 Plus offers 16 days of battery standby time and 12 hours of web browsing. It is said to be the Fastest wireless, Far and wide.. IPhone 6 has faster LTE download speeds, and it supports more LTE bands than any other Smartphone so you can roam in more places. And when connected to Wi-Fi, you'll get up to 3x faster speeds. Also, You don't need a wallet with you all the time if you have iPhone 6 plus because it provides you with the best facility of Apple Pay through which you can pay for anything you buy by just entering the amount and putting your fingerprints on the phone. Through this your money gets deducted from the bank just like you pay through a debit card. Your fingerprint is the perfect password because you always have it with you. And no one can ever guess what it is. Their breakthrough Touch ID technology uses a unique fingerprint identity sensor to make unlocking your phone easy and secure. Iphone 6 Plus is full of more amazing, fancy, cool and outstanding features. HTC One M8 has such a unique feature and that is its Duo camera. We were so curious as to what the dual-camera setup on the back of the phone was for. Now we know, and it's officially called Duo Camera. First, there's a 4 Ultra Pixel camera lens, but it's slightly better than the original Ultra Pixel camera in that it takes better shots all around. Its low light shots are even better. You can even change the focus by blurring the foreground or background. Its camera has blown up many minds. Another unique feature of M8 is its front facing features that every user desires to have in his phone. Front facing speakers mean having a great and better audio experience whether you're playing an audio or watching a video. The speakers are 25 percent louder than before. M8's designs are also one of the best looking designs in the smartphones with a sleek aluminum body. It feels perfectly balanced with a 5-inch large display. And the most impressive, yet unique feature of M8 is its extra power saving mode. Although this mode is also available in other phones, but its power saving is totally unique. The phone can automatically, or manually, be tweaked to milk the very last drops of battery life for many extra hours, it allows you to place phone calls, send text messages, manually pull in your mail and more. Your phone is hopefully always there for you in emergencies now. The HTC One M8 offers a ton of improvements over last year's model, from Sense 6 to a brand new camera UI that's fun and easy to use. There are new motion controls, too, and a lot more! Xperia Z3 has been awarded as one of the Best of CES awards. It keeps the glass-covered front and rear and the aluminum band that holds it all together, which gives a stylish and slim look to this phone. The Sony Xperia Z3 has a brilliant display and beautiful design. If you have a PS4, you'll also be able to play PS4 games remotely on your phone. This is a remarkably unique feature of this phone. Z3 comes in so unique and cool colors that are copper and silver green, plus the standard black and white. Battery life is also a big focus for Sony, as it stays for about 48 hours. The Japanese giant promises that the Xperia Z3 will survive a full two days of average use. This magical feature is very rare in smartphones. The Sony Xperia Z3 has a very impressive rating, which is that neither water nor dust can get in the way of performance for this slim and sleek Smartphone. With the waterproof Xperia Z3, you can take pictures with the best Smartphone camera while swimming in water for up to 30 minutes. You can even dive down to 1.5 meters with it. This feature is in none of the phones. Although many phones are waterproof, but you still can't dive with them the way you can with your Z3. This device has the industry's only 3rd generation LTE/4G modem. This enables blazing Internet connections with download and upload speeds that are twice as fast, so file transfers and media streaming is now smoother than ever. Another fancy feature Xperia Z3 is it Blocks out the noise. Xperia Z3 has a digital noise cancelling technology which reduces exterior noise by 98 percent when paired with the MDR-NC31EM headset. The technology removes the low-frequency parts of the noise, preventing the high-frequency part of it from reaching the ear. This way, if you are out on a road, a noisy bus, traffic noise or a busy area won't create any hindrances in the way of a good listening experience. 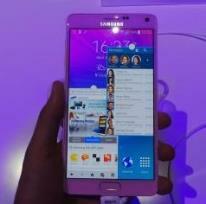 Galaxy Note 4 has features you'll want to buy it after reading the post. Their remarkable feature makes you want to buy it. Note 4 have a very unique capability of providing its users with "Multi Window Mode" by which you can use two applications at the same time with the Pop out window on your screen. You can also minimize and use the second app and then maximize again to start using your previous application. So, multitasking is not a problem now if you have this amazing phablet. Its great work of art and design includes its amazing digital microscopic feature through which you can look from very up close between 200 to 500 times. Note 4 have a UV monitor that notifies its users about sunlight exposure and also notifies about the heat rate through a red LED light at its back. Samsung has increased the Stylus pen's sensitivity of its Note 4 to 2048 points. Using such a pen makes you feel like you are writing on a paper. This also makes your text handwriting look better with twists, turns and speed. Another specialty of its stylus is that is now has calligraphy and fountain pen modes. You can also highlight words or images just like you do with a traditional mouse. Another exciting feature of note 4 is "Snap Note" with which you take a photo of writing on a chalkboard or white board and Snap Note will correct for any tilt and then pull the text off the board so it looks like a note you created and then you can add to it. This is amazing for meetings and class. None of the smartphones, except Note 4 has this cool and fancy feature. The "Smart Select" feature of this phablet is also a cool feature. You can now select pictures, or any other this in your phone just like you select it through a mouse by clicking dragging. One does not need to mark each object separately. With your note 4, you even can control your television, LCD's, DVD's and projectors by connecting it once with it, you can make your phone work as a controller for these devices and can switch them on or off, change channels etc. Samsung Galaxy Note 4 has a Fast charge speed and it has a great battery time. Once you have charged it properly, its battery doesn't drop completely even after heavy usage of 2 days. The best thing is it doesn't take too much time to get charged, after 30 minutes of charging, its battery goes up to 90 percent. These smartphones are a blessing in today's world where you have a busy routine and lots of work to do. These phones provide you with the best facilities and minimize your time with their best. The above mentioned were the top 10 phones with incredibly amazing, cool and fancy features and technology, which was an impossible thing in the past years. That is the best article I could see in recent times on Techulator. It is great to see all those fancy phones together. I just wish we could have all those cool features together in a single device! It is too bad that we can not hope for it anytime soon what with those patents and copyrights. What a nicely explained information about the top 5 smartphones of year 2004 in this article. This will really help to users to choose the best device for them. Excellent article.